Scientists have discovered that adding a missing protein to infertile sperm could help “kick-start” its ability to fertilize an egg and significantly increase the chances of a successful pregnancy by increasing male fertility. Researchers at Cardiff University’s School of Medicine hope to produce the protein and use it to naturally stimulate egg activation. 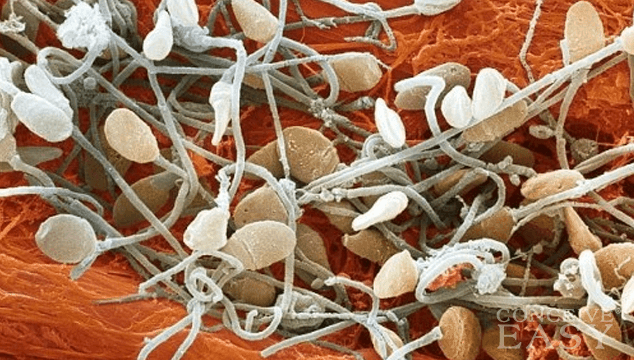 Researchers found that sperm transfers an essential protein, called the PLC-zeta (PLCz), to the egg during fertilization that initiates a process called “egg activation” which triggers all the biological processes necessary for the development of an embryo. The latest finding, published by the journal Fertility and Sterility, could offer hope to couples undergoing IVF treatment by improving their chances of conceiving. Researchers explain that eggs that do not fertilize because of a defective PLCz, as in some forms of male infertility, can be treated with the active protein. They found that adding PLCz triggers the start of the fertilization process and significantly improves the chance of a successful pregnancy. Lai added that in the future, scientists may be able to produce the human PLCz protein and use it to stimulate egg activation in a “completely natural” way. “For those couples going through IVF treatment, it could ultimately improve their chances of having a baby and increase male fertility,” he said. Researchers noted that up until now the latest finding has only been observed in experiments involving mice, but never with human sperm. “In the lab we have been able to prepare human PLCz protein that is active. If this protein is inactive or missing from sperm, it fails to trigger the process necessary for egg activation – the next crucial stage of embryo development,” Lai said. “However, when an unfertilised egg is injected with human PLCz, it responds exactly as it should do at fertilisation, resulting in successful embryo development to the blastocyst stage, vital to pregnancy success,” he concluded.